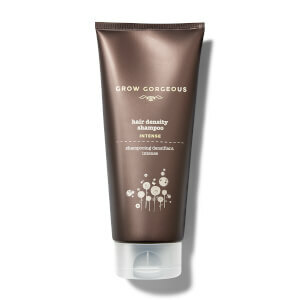 Achieve visibly thicker hair with the Grow Gorgeous Hair Growth Serum Intense. Developed with a high concentration of technologies for maximum efficacy, the formula aims to enhance the appearance of fine, deflated hair to promote fuller, healthier-looking locks. Providing hair-enhancing properties, the gluten-free serum blends a complex of powerful actives for elevated results, including Zinc (a unique glucose compound) and Glycine (a key amino acid for hair health). Delivering visible results in as little as four weeks, the hair growth serum increases the thickness of each hair strand by 13%*, lending locks a fuller, thicker-looking appearance. The solution also contains an extra 3% concentration of Caffeine for advanced benefits, plus Hyaluronic Acid to penetrate the scalp and improve hydration for a luscious, voluminous effect. After use, hair appears fuller, shinier and visibly denser. Free from gluten, parabens, silicones and sulphates. *Based on an independent user trial and instrumental testing. Aqua (Water), Butylene Glycol, Caffeine, Propanediol, Dimethyl Isosorbide, Maltodextrin, Glycerin, PPG-26-Buteth-26, Acetyl Tetrapeptide-3, Sodium Hyaluronate Crosspolymer, Hydrolyzed Sodium Hyaluronate, Arginine, Glycine, Lactic Acid, Gluconolactone, Zinc Chloride, Calcium Gluconate, Trifolium Pratense Flower Extract, Scutellaria Baicalensis Root Extract, Glycine Soja Germ Extract, Triticum Vulgare Germ Extract, Larix Europaea Wood Extract, Pisum Sativum Extract, Camelia Sinensis Leaf Extract, Dextran, Pentylene Glycol, Urea, Trisodium Ethylenediamine Disuccinate, PEG-40 Hydrogenated Castor Oil, Polyacrylate Crosspolymer-6, Hydroxyethylcellulose, Xanthan Gum, Sodium Metabisulphite, Sodium Benzoate, Ethylhexylglycerin, Phenoxyethanol, Chlorphenesin, Parfum (Fragrance), Cinnamyl Alcohol, Alpha-Isomethyl Ionone, Linalool, Limonene, Butylphenyl Methylpropional, Hydroxyisohexyl 3-Cyclohexene Carboxaldehyde. It is a "must have" product for me, it really works! My hair loss normalized eventually! This product smells amazing. But I can’t see a difference in my hair at all. I would not recommend it. After years of searching for a volumizing product for my fine, limp hair I have finally found my HG product. I got it in a set together with the Hair Density shampoo and conditioner and never expected the serum to be so volumizing (the shampoo and conditioner are also amazing btw. though they can be a bit drying depending on your hair type), but it is truly a miracle worker. It actually lifts your roots without any greasy or sticky feeling. I have never experienced such a profound effect from a product before and, believe me, I've tried A LOT in various price ranges. I haven't used it long enough to notice any new hair growth, but after about a week of use my hair falls out much less than before. It's really noticeable after washing and I didn't expect that to happen so soon either. HIghly, higly recommended! P.S. If you're using it after some other conditioner, be sure not to get the conditioner near the roots, because then the serum can't penetrate enough and the effect is not so noticeable. And blow dry your hair upside down, then you'll really get XXL volume. This product is amazing! Since using for a week along my hairline the baby hairs have begun to grow back. It leaves the hair sticky and hard so I would use of an evening overnight and on a day off. 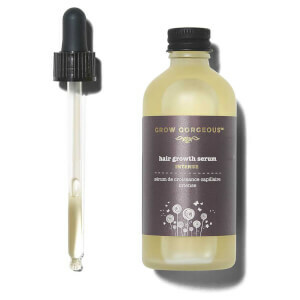 I absolutely love this hair growth serum. I've tried so many products, my hair is long but fine, slightly reseeding from wearing very tigh buns and constantly falling out. But this really helps make my hair stronger and much more dense at the root, I tend to add a few drops just at the front of my hair line and that’s really helped with my baby hairs growing back. Generally my scalp overall looks thicker and my hair growth most definitely has speeded up. I’ve gone through 5 bottles of the intense version, it’s a staple product in my routine. My hair began to fall after giving to birth to baby, and there is hair everywhere on the floor every day, which terrifies me. I've been trying this product for about two weeks, and my hair stops falling so badly. It smells good and is not greasy. Hope it can help my hair grow thicker! Its not greasy. Makes hair fuller and denser. Feels like the hair have the double of the volume. Hair feels full and dense, and roots have more volume. Its expensive, but it works. Its not greasy at all, wish is fantastic! refresh and release the scalp. it 's quite helpful to strong the hair and reduce hair loss after using this product 4-5 times. I have quite fine, mid length hair and have tried a lot of different products to thicken and encourage growth and I bought this product specifically to help grow out fine baby hairs round my hairline / temple area. It has done absolutely nothing. They recommend only 5-10 drops at a time but that goes nowhere so you need at least 20 to cover even part of your scalp, and the formula dries in sticky and greasy looking, so unless you plan to wash your hair the next day it's no use. If it worked, I wouldn't mind, but it was a complete waste of money.